INDIAN WELLS, Calif., Nov. 7, 2018 /PRNewswire/ -- PGA REACH, the 501(c)(3) charitable foundation of the PGA of America, has announced that Sunday, Nov. 11—Veterans Day— will serve as the 2nd Annual PGA National Day of HOPE. 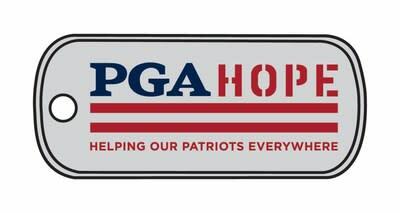 PGA National Day of HOPE has two goals: Celebrate our nation's heroes who protect our freedom; and raise awareness and support for PGA HOPE (Helping Our Patriots Everywhere), the signature military program for PGA REACH. To support PGA National Day of HOPE, a lineup of special events will take place in conjunction with active HOPE chapters across the United States. Currently, there are more than 90 HOPE Chapters helping more than 2,000 Veterans annually. T o make a donation, please visit PGAREACH.org . Veterans participating in the Northern California PGA Section HOPE program will be recognized on-field at Levi's Stadium prior to the NFL's Monday Night Football game between the San Francisco 49ers and New York Giants. Additionally, an inspirational "Hero" video featuring Jack Nicklaus , which debuted last year in conjunction with the inaugural PGA National Day of HOPE, will be relaunched and shared through PGA and partner digital and social channels. The video demonstrates the true power of PGA HOPE, highlighting the positive impact of golf programming on military Veterans with disabilities. "Golf can be an effective part of the therapeutic rehabilitation process, and PGA HOPE is making a difference in the lives of thousands of veterans," said Ryan Cannon, Senior Director, PGA REACH. "PGA HOPE programming takes place year-round, but on Veterans Day, we invite the entire golf community to join us in honoring our country's heroes, and raising awareness for PGA HOPE, so that it can continue to expand and serve even more veterans." For more information on PGA HOPE or to make a donation, please visit PGAREACH.org .